High in fiber, vitamins, minerals and antioxidants, fruit and vegetables may reduce your risk for heart disease, cancer, obesity and Type 2 diabetes. Some detox diets promote eating only fruit and vegetables for a period of time to cleanse the system of toxins and improve digestion. Although there is no evidence to support that these diets work, there's no harm in eating only fruits and vegetables for three days. Just be sure to resume your normal diet including all of the food groups at the end of the three days. Speak to your doctor if you have any health conditions that may make it dangerous for you to follow a fruit and vegetable diet. Rather than abruptly changing your diet for three days, you can make certain changes in the period leading up to your diet that will make it easier and gentler on your body. Dr. Ben Kim, a chiropractor who runs a fasting clinic, recommends tapering your consumption of several types of foods and beverages for at least a few days and as much as a week beforehand. These include alcohol, caffeine, salt, sugar, other types of sweeteners and all animal foods, such as meat, eggs, fish, dairy, shellfish and poultry. Kim warns that because these foods are more stressful for your digestive system to process, cutting them out of your diet suddenly can create uncomfortable withdrawal symptoms. You can choose any fruit or vegetable to include in your three-day diet. Variety is important, as is not eating too many starchy fruits and vegetables like potatoes, corn and bananas. These can spike your blood sugar and potentially leave you feeling drained of energy. All types of greens are good choices, as well as avocados, tomatoes, beets, carrots, cucumbers, zucchini, all types of squash, asparagus, cabbage, mangoes, melons, grapes, onions, bell peppers, citrus fruits and berries. A lot of cleanse diets suggest that eating fruits and vegetables raw is better for your health. But this isn't scientifically proven. In fact, there is some benefit to cooking your produce -- at least some of your veggies. While high-heat methods like frying can destroy some nutrients and increase your fat intake, certain nutrients actually become more bioavailable when cooked, such as the antioxidant lycopene in tomatoes. If you plan to cook your veggies during your three-day diet, choose a cooking method least likely to deplete nutrients. Of all the methods tested in a study published in the "Journal of Zhejiang University SCIENCE B" in 2009, steaming broccoli preserved the most vitamin C, chlorophyll and antioxidants called glucosinolates. Whip up a smoothie for breakfast with berries, mango, banana and leafy greens, and add some avocado for healthy fats and a creamy texture. Kim notes that the fatty acids in avocado can help you stay full until your next meal. For lunch, enjoy a large salad with all your favorite vegetables, and even some fruits for sweetness. Use lemon juice and dash of extra virgin olive oil for a salad dressing, if desired. After your salad, if you need a little something extra to keep you full until dinner, Kim suggests a steamed Yukon gold, new or sweet potato. For dinner, you can have any variety of raw or steamed vegetables and fruits that you like, but have at least equal amounts of fruits and veggies, recommends Kim. For snacks, Kim suggests raw veggies dipped in guacamole. Sip on sparkling or plain water and unsweetened green or herbal tea. 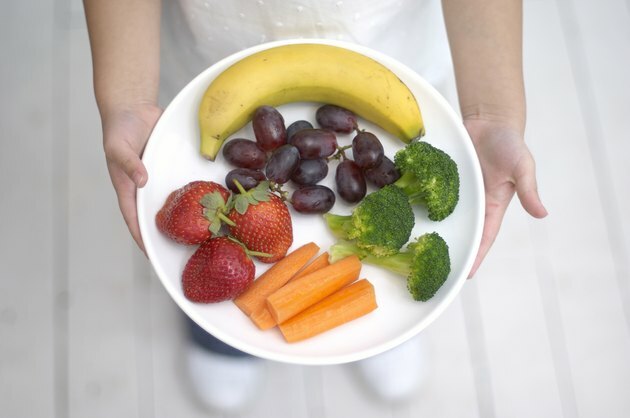 USDA ChooseMyPlate.gov: Why Is It Important to Eat Fruit? Ask Dr. K.: Do Cleanses and Detox Diets Work?